In the last couple of weeks I gave two interviews on ACTA, one for a local online magazine and the other one as part of my 90-minute interview for a local radio station, I took part in the roundtable discussion with some politicians and I spoke at the open discussion on ACTA at The National Assembly of Slovenia. People in my country do care about online privacy. ACTA was negotiated in private, so many questions remained open. ACTA failed at both of them. I’m happy to report that half of Slovenian Members of the European Parliament and many Members of the National Assembly were present, but the only one out of 25 speakers speaking in favour of ACTA was the foreign representative of the EU Commision, Anders Jessen. Slovenian government informally decided to freeze ACTA ratification. You really have no idea how much I am proud of you man! WoW! It is like: I know this guy! 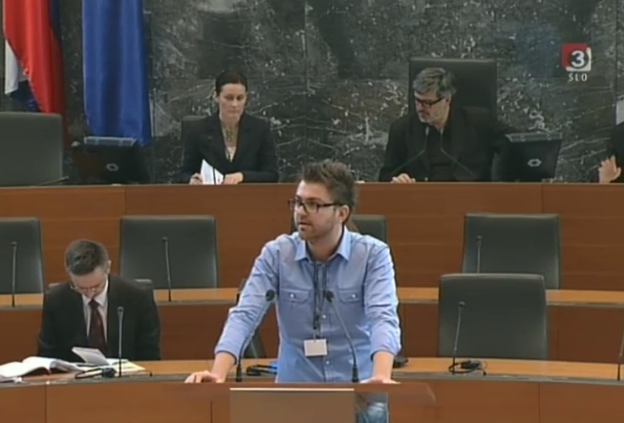 My friend is speaking in the Slovenian Parliament. It is really inspiring to see this and enforcing to take action everywhere! Kudos, Matjaž! Your leadership, and ability to seize this moment in history, is a great example for all Mozillians. proud of you man! keep up! Congratulations, I hope that France will follow the example of slovenia.